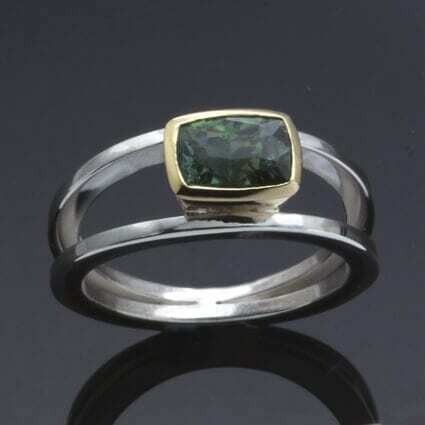 A beautiful, sleek and modern cocktail or dress ring designed and crafted by Julian Stephens Goldsmith, offering a unique, contemporary design that is eye-catching and elegant. This stunning ring is the latest addition to Julian Stephens ‘Ruscello Collection’ – modern, fluid dress rings, engagement and wedding bands which playfully use negative space to create magical and modern design. 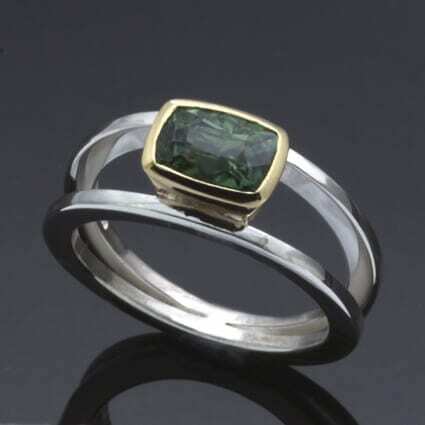 This sleek, modern cocktail or dress ring uses a pair of lines of solid Sterling Silver which flow softly around the finger, gathering in the front of the design to create a solid 18ct Yellow Gold collet setting to complement and enhance the 1.16ct green Tourmaline gemstone centrepiece. 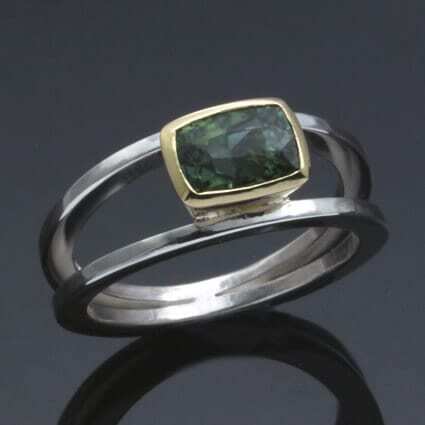 This beautiful one of a kind ring is finished with a glossy polished effect by our master Goldsmith Julian Stephens, to create this a memorable, meaningful design which proudly bears Julian’s exclusive makers mark and Hallmark.